Clifton Park, New York – Internet marketing professionals now have a new tool at their disposal when it comes to planning and attending industry networking opportunities and events. One of the oldest Internet marketing communities, Threadwatch.org, under the direction of owner Jim Boykin, CEO of Internet Marketing Ninjas, and his team of SEO and Internet marketing professionals, has launched a new community-driven event and conference listing function, as well as a customizable calendar. Threadwatch community members can use this new feature to find events in which they may be interested and review who, within the same community, plans to attend and/or present at specific events. Likewise, community members can mark events for which they plan on attending. This information can be shared with the community and added to their customizable calendar to be used as a planning tool for conference scheduling and attendance. By facilitating conference awareness and allowing fellow community members to openly view events and conferences through their public profile, Threadwatch continues to foster a strong community and makes it easier to plan and participate in networking events and conferences, and connect with fellow Threadwatch members. 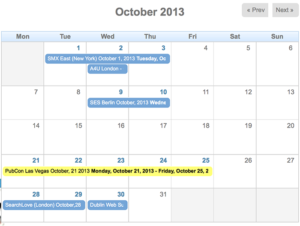 As a community-focused website for SEOs and other Internet marketing professionals, Threadwatch’s new calendar functions and conferences/events listing have been developed to meet the needs of its members to participate in and connect through industry happenings, including both intimate events and larger conferences. Internet Marketing Ninjas and Threadwatch have long been involved in industry events and strongly believe in the value of community involvement. Founded in 2004, Threadwatch.org was resurrected in January 2013, when it was gifted to Jim Boykin, CEO of Internet Marketing Ninjas, by Aaron Wall of SEOBook.com. With the support and assistance of some of the most prominent industry leaders, the Internet marketing community and forum has experienced a resurgence of interest as a favorite for timely discussion and resources among experts and professionals within various areas of SEO and Internet marketing. Internet Marketing Ninjas (IMN) is a results-driven, full-service Internet marketing company founded and led by Jim Boykin. The company is based in Upstate New York and employees approximately 100 full-time ninjas, who specialize in assorted areas of expertise, including website analysis, link building, content development, and conversion optimization. Formerly, We Build Pages, the growing company rebranded in 2011, in order to better reflect its diverse services. Internet Marketing Ninjas is heavily involved in industry events and Boykin, as well as other members of the executive staff, regularly contribute and present at SEO and Internet marketing conferences. A good one from Threadwatch.org. I agree that with this tool Internet marketers are better equipped.